It looks as though your membership limits your access to this section. To properly explore the Flavour Trail, please upgrade your membership to Adventurer status. Elevate your discovery of spirits to new heights through joining the tasting adventure of our premium and craft spirits offerings. Let the Flavour Trail recommend spirits based on your personal flavour profiles. Make personal contributions to an invaluable guide for distilleries around the world. Paying Homage to the 18th century British nautical origins of ‘100 Proof’ alcohol, Port Askaig has released a cask-strength single malt whisky that is sure proof to meet this standard and label. The whisky is sourced from an undisclosed distillery on the Scottish whisky producing region, Islay and brings a minerality and sweetness to the palate. Amongst its meaty yet richly layered smokiness, Port Askaig 100 Proof opens with coastal sea spray that masks a delicate fruitiness on the nose. Sit with it in the glass for a few minutes longer; when taking a sip you will be rewarded with spicy hints of cinnamon and a touch of earthiness that is followed by sweet chocolate. The finish rounds-off with subtle stewed apple, spice and a after-breath of char-smoke. Elements of Islay Peat brings together a selection of exceptional peated whiskies produced from well renowned distilleries located in Islay, Scotland. Keeping each distillery undisclosed, Peat Full Proof is a blended malt showcasing an assemblage of flavours that demand your attention. As whisky colour goes, this is pale gold hinting the sole use of American White oak casks for maturation. Commanding the senses is peat smoke offering smouldering embers and seafaring saltiness. Palatable with sweetness, fruity undertones and bacon strips, Peat Full Proof moves around the palate with ease and offers a textured mouth-feel. The finish is long and exhales real smokiness with sweet spice and green fruits. Port Askaig Aged 15 Years is a limited edition Islay expression showcasing the marriage of heavily peated whisky distilled in 1997, with richer and fruitier whisky produced in 2001. The final bottling embodies the nature of the Oloroso Sherry cask used to mature the peated whisky spirit. Presenting a fragrant smokiness of heather and honey topped with vanilla and subtle berry undertones, this 15 years old Port Askaig aroma is floral with a touch of brine – rounding-off to an earthy-peat presence on the nose. Its initial palate is slightly oily with a sweet, pleasant mouth-feel. A zesty citrus nuance is welcoming and couples well with a drying sensation on the tongue before leaving you with a long, smoky aftertaste. Elements of Islay have a saying: The most important element of Islay is peat. 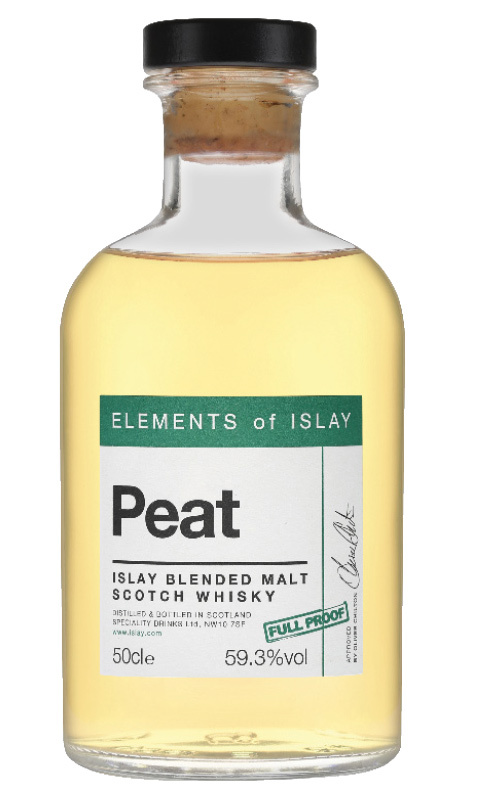 Peat Pure Islay is the companion to Elements of Islay’s Peat Full Proof with one major difference, it has been carefully blending to ease the ABV from full cask-strength to a more approachable and easy-sipping 45% ABV. Maritime charm with sweet apple, orange peel and citrus. 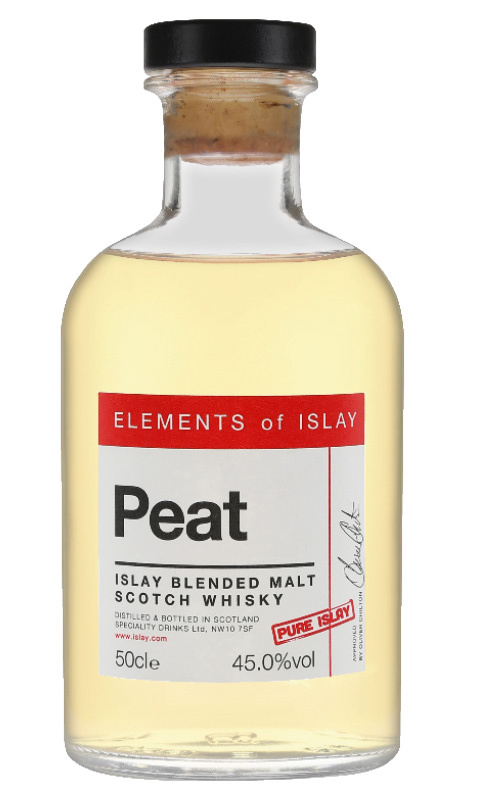 Peat Pure Islay is a powerfully peated expression that usurps fear with comfort. It is sweet and softly textured but adds a warmth on the palette with hickory smoke, salted caramel and a touch of chocolate. Having an ABV of 45%, Peat Pure Islay is a well-balanced whisky and offers personality from the American white oak cask influence yielding a finish of sea spray and sweet spice. Port Askaig limited edition Islay whiskies are made in small batches created from 2 to 20 specially selected casks. As a limited 19 year old whisky, the minimum age of this single malt by law is 19 years – no less. Aged exclusively in refill American white oak casks, this Port Askaig is a remarkable coastal Islay style. On the nose, this whisky offers maritime coastal sensations and an earthy peatiness. Coupled with floral notes, orange and lemon; when tasted the American white oak cask shines through with spicy clove and cinnamon. The finish is rounded and lingering offering fruity flavours of citrus with smoke on exhale. Elegant and complex, the Port Askaig Aged 19 Years is a whisky to be enjoyed in good company. Not a member yet? Become a Member to explore the flavour trail.